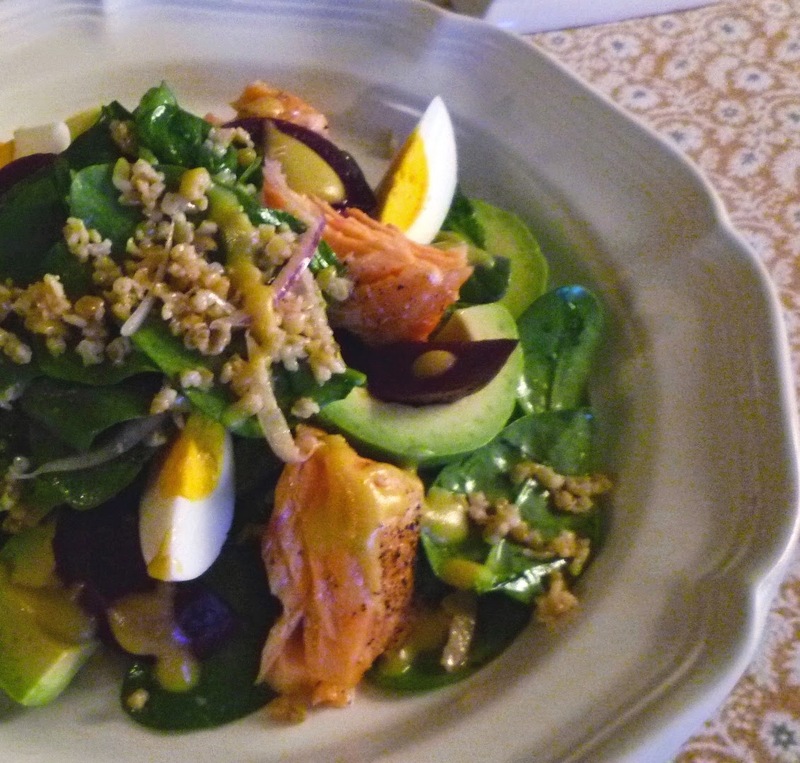 Over the past few years I have posted several salads that feature a grain (quinoa, barley, farro, wild rice, etc.) in the starring role. Some of these salads include greens, but most do not. For those that do include greens, the greens function mostly as a garnish. I love grains…and I love hearty, substantial salads…so these grain-centric salads are frequently what I gravitate towards when I’m preparing a main course salad for dinner. But this past fall, one night I decided to change things up a bit and make a salad with grains that was more salad-like….heavy on the greens (baby spinach), with a small amount of a cooked grain (freekeh) tossed in to add textural interest (much like a handful of dried fruits or nuts would do). I loved the result. Yesterday I ran across my notes for that salad and decided to make it again. It was just as delicious as I remembered it. I should warn you that if you decide to make this salad that you will find it is not much of a departure from my normal preference for substantial salads. 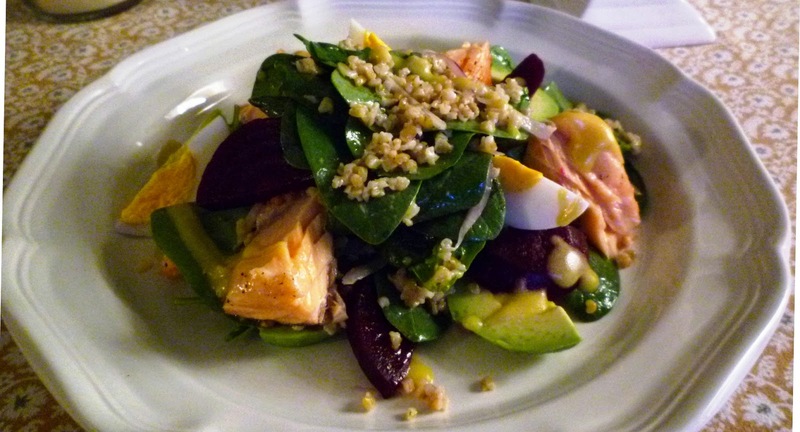 Spinach has the ability to stand up to any number of hearty additions, so besides the freekeh, I included slow roasted salmon, hard cooked eggs, roasted beets and avocado. The salad is satisfying and filling…and brightened by the addition of some thin slices of red onion and a tangy Dijon vinaigrette. I am posting the “recipe” (more of a list of ingredients, actually) for the salad as I made it: for two. But as always, you can multiply it to your heart’s content. For some of the ingredients I have given a range of quantities because salads should always be about adding and subtracting ingredients to please your tastes and your appetite. I assembled the salad on two individual plates, but I think in larger multiples that this salad would be beautiful built on a large, shallow platter and served family style…or on a buffet. I am also not providing detailed instructions for preparing each of the ingredients in the salad. Rather, I’m providing links to posts I have written that provide detailed instructions for the techniques involved. Once you have all of the individual ingredients cooked (and they can all be cooked ahead) the salad can be assembled in a few minutes. 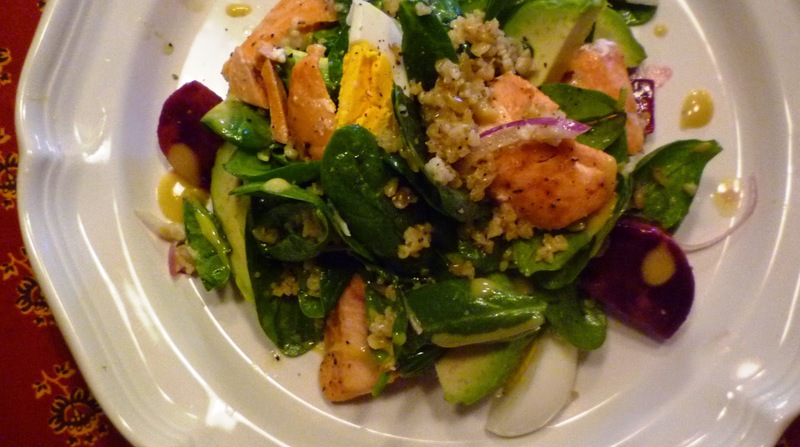 It should go without saying that this salad would be a perfect place to use up leftovers—a few chunks of leftover roasted or poached salmon, a small amount of a leftover cooked grain (bulgur would be good in place of the freekeh) as well as the beets, which are nice to roast in quantity and keep on hand for adding to any meal….as a side or part of an impromptu salad. I was so glad I stumbled across my notes for this salad. It made an immensely enjoyable dinner. Not only is it loaded with many of my favorite ingredients, but it was so nice to have something bright and fresh…. Exactly what my palate craves after the normal steady diet of the rich and hearty foods of the midwinter months. While the freekeh cooks roast the salmon, make the vinaigrette and gather the remaining ingredients. The salmon may be used right away or allowed to cool briefly. Break the salmon into large, random chunks. When ready to serve the salad, place the spinach in a large bowl along with the onion and cooled freekeh. Season with salt and pepper and drizzle in a couple of tablespoons of the vinaigrette. Toss until everything is lightly coated with the dressing, adding more if necessary. Build the salad by layering and nestling the dressed greens with all of the other elements in an attractive manner, dividing the ingredients equally between the two plates. Drizzle more vinaigrette over all, concentrating on hitting the beets, avocado and egg. Serve immediately. Dijon Viniagrette: Place 2 T. of red wine vinegar in a small bowl and whisk in a two or three good pinches of salt. Add 2 T. Dijon mustard and whisk until smooth. Drizzle in 1/2 cup of olive oil, whisking constantly as you do. The vinaigrette should thicken and emulsify as you whisk in the oil. Taste and correct the seasoning with salt & pepper. This recipe makes 3/4 cup of vinaigrette and you will probably not even need a third of it for two salads. You can of course make a smaller amount, but this is a great basic vinaigrette to make and keep on hand in the refrigerator for dressing small dinner or lunch salads—it is versatile and tangy, and goes with a lot of different foods. Note: If you have never made a hard cooked egg before, here’s how I do it when I am only making a few. Place the eggs in a pan just large enough to hold them in a single layer. (It’s ok if the pan is a bit bigger than this, but if it is too large the eggs will tend to overcook in the amount of time it takes to bring the water to a boil. For a small number of eggs, you will probably have to use a one quart saucepan.) Add water to the pan so that the eggs are covered by a half inch to an inch of water. Set the pan over high heat and bring just to the boil. Turn the heat off, cover the pan and let the eggs sit undisturbed for 10 to 12 minutes. I always cook an extra egg so that I can quickly peel and cut open an egg to see if it’s done to my liking. I prefer them a bit underdone—with just a trace of creaminess in the center. If the egg isn’t done, just continue to cook the remaining eggs for another minute or two…or however long you deem necessary to achieve the desired doneness. (Eat the extra ‘tester’ egg for a snack….they’re delicious and good for you.) Place the cooked eggs in cold water and peel as soon as they are cool enough to handle. That looks so good! I would just need to use quinoa instead of Freekeh. Thanks Katrina! I think quinoa would be delicious in this salad!